A 67-year-old woman who is in a critical condition after a crash in Derry has been transferred to the Royal Victoria Hospital in Belfast. 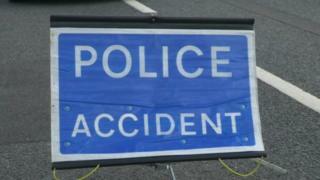 The two-car collision happened on Victoria Road in the Waterside area at 19:30 BST on Tuesday. The woman was the driver of one of the cars. Her passenger, a 35-year-old man, suffered minor injuries. An 18-year-old man, who was driving the other car, has been arrested. The Victoria Road has now re-opened.